Dove is losing sight of its strengths following a string of attention-seeking ads this year, industry leaders have warned. 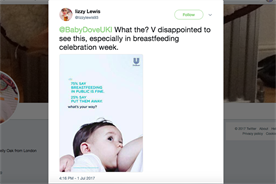 Last week, the brand pulled an ad for Baby Dove that was widely criticised for seeming to validate the views of people opposed to breastfeeding in public. In May, Dove was ridiculed on social media for a range of bottles designed to represent women’s body shapes. Moreover, print ads in January that mocked Donald Trump by featuring "alternative facts" were attacked for not fitting with the brand’s identity, despite winning praise for their humour. 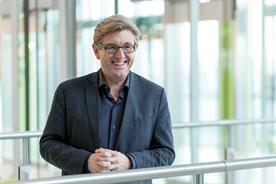 Daryl Fielding, chief executive of The Marketing Academy Foundation, said the examples missed the mark because they were "shallow, irrelevant to product or just not connected to the brand’s positioning of honesty". 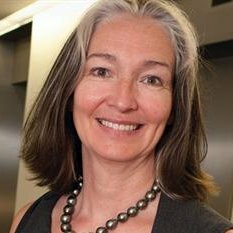 Fielding led the development of Dove’s "Campaign for real beauty" in 2004 while at Ogilvy & Mather. The breastfeeding ad lacked a connection with the products despite the importance of the issue, she said, and raised a problem without offering a solution. The "alternative facts" ads, meanwhile, missed a "huge opportunity" to either flag up the brand’s association with honesty or discuss Trump’s attitude to women. Dove is in danger of being a brand that "simply wants to be heard", Leo Rayman, chief executive of Grey London, said. He argued that Dove was trying to start a debate about breastfeeding for the sake of it, while the special bottles had the opposite effect to the intention: "If you truly are the champion of diversity, you would understand that people probably don’t want to be reduced to six shapes." A Unilever spokeswoman said Dove was "proud of the strong and sustainable brand equity which we have built through our campaigns" and it would continue to use "a wide variety of creative executions with the objective of supporting our consumers to feel confident and empowered". 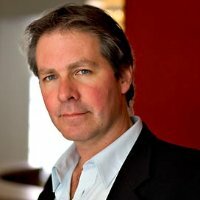 Sean Kinmont, founding partner and creative director at 23red, defended the brand, saying that recent failings came not from "malice or cynicism but an attempt to be the good guy". Dove now needs to tread carefully to maintain its "contract of trust", he added. 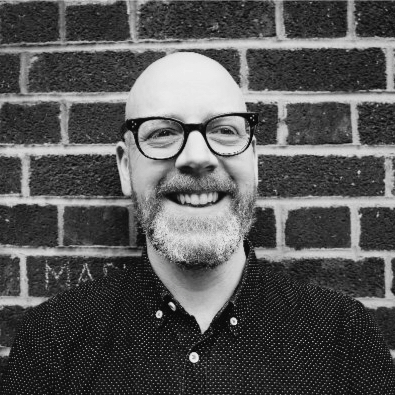 Theo Izzard-Brown, chief strategy officer at McCann London, suggested that Dove should pick a "fresh, culturally charged battleground" in which to be a powerful voice. 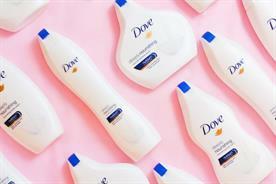 However, Emma Worrollo, managing director and founder of The Pineapple Lounge, which specialises in family marketing, said Dove had become a victim of the purpose-driven marketing that it pioneered. Consumers have been "overexposed to brands wading in too deeply on social and political issues", she said. Thirteen years after the launch of "Campaign for real beauty", Dove should be forgiven "a few missteps", Malcolm Poynton, global chief creative officer at Cheil Worldwide, said. But he urged the brand to "continue its mission on a mass, populist scale" rather than rely on stunts. How can Dove get back on track? 1. 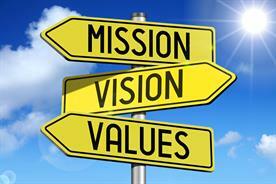 Make sure there is clear purpose expressed, based on the brand’s strategy. 2. Make ideas relevant to the customer with a really potent insight or ensure Dove presents a clear solution at the product or brand level. 3. Like any great creative, make ads original and clever, funny or powerful. 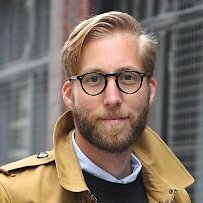 Is this just industry navel-gazing? • 74% thought the brand had a right to talk about how mothers feed their babies. But there was one result the likes of Dove, Heineken and Pepsi should take note of: 49% of respondents said they were bored by brands asking them to "join the debate". Where is Dove going wrong? Read what six industry leaders have to say about the direction of the brand in recent months. As the agency lead that originated this campaign, I am the last person to slam the brand for making mistakes. We made loads, but thankfully, mostly in private. But I am sad to say that I think these offerings are off the mark because they are either shallow, irrelevant to product or customer or just not connected to the brand's positioning of honesty. The bottles idea is somewhat shallow, but at least it is relevant. And it is on brand. The curse could have been taken off its shallowness by adding charity donations in some way. I rather wish the detractors would lighten up a bit on this one. The Trump-bashing effort really comes undone on the issue of relevance and the choice of deodorant makes it beyond shallow. It's a shame because the brand team have missed a huge opportunity in going after Trump. As a brand that champions honesty, they could have added "Tell the truth. We do" to the fake news spoof, making it relevant and on brand. Or even better, they could have taken his attitude to women and done something with that. Now that would have been brave and relevant. The childcare ads fail because they have no connection with the product despite the fact that the issues highlighted are very relevant and deep. Consumers want a solution from brands that dramatise a problem, and Dove does not provide one explicitly or implicitly. 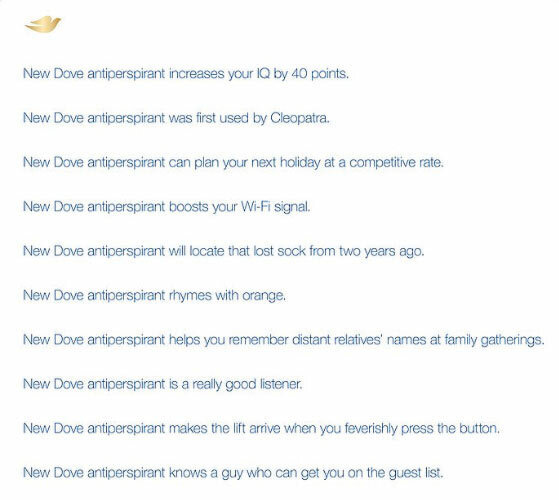 I hope the Dove team regroup and think of these as just hiccups. And keep faith with a great brand and a great strategy. Dove appears to have shifted from a brand that truly championed a cause it believed in (celebrating real women), to a brand that simply wants to be heard - like that annoying kid at school who puts their hand up for every question even when they don’t have anything to say. The "fake news" ad, which sported alternative facts such as "New Dove antiperspirant makes you smarter" and "New Dove antiperspirant makes your wifi signal better", just made me think the brand should not be getting involved in a fake news debate. It has nothing to do with their product, their essence, or their beliefs. And it isn't their best writing. Not funny, intelligent or incisive enough. The breastfeeding ad, which says "75% say breastfeeding in public is fine. 25% say put them away. What’s your way? ", felt totally off. Firstly, breastfeeding is not an issue for public debate. Breastfeeding in public is totally fine. It’s not illegal and it's not immoral. I honestly don’t see why the brand would sit on the fence about this. And secondly, it once again feels like Dove is making commentary for the sake of it. Why open up the debate? What’s the link to the brand or its products? What’s the point Dove is trying to make? As for the bottle ad, where Dove released six different bottle shapes to represent diversity, it left a lot to be desired. If you truly are the champion of diversity, you would understand that people probably don’t want to be reduced down to six shapes. And white shapes at that. I think Dove risks undermining its wonderful position as a brand that once had a true purpose and people got up to fight for every day, which genuinely championed real women. It now just feels like the brand is trying to grab attention by being clever rather than truly believing in what it is saying or doing. By picking such a contentious topic and sitting on the fence, Dove’s commercial desire for universality and the brand’s ability to champion a clear single-minded opinion have come into conflict. The real problem with Dove’s new campaign endline ‘what’s your way?’ isn’t its soporific blandness, but the fact it misses the open goal opportunity for Dove to pick a fresh culturally charged battleground. There’s a sobering brand lesson to be learned here, and that’s beware trading clear opinion in pursuit of wider relevance. Dove knew the importance of having an opinion when they launched their ‘Campaign for Real Beauty’ in 2004, which was instrumental in challenging long-perpetuated industry myths on what female beauty is. 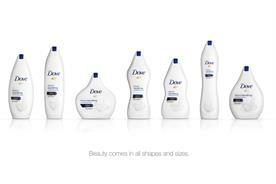 Dove drew a line in the sand and denounced the re-touching of images. The public knew what they stood for, so felt able to make an informed choice – is Dove a brand for me or not? Sadly, their latest breastfeeding ad misses the mark. By picking such a contentious topic and sitting on the fence, Dove’s commercial desire for universality and the brand’s ability to champion a clear single-minded opinion have come into conflict. The real problem with Dove’s new campaign endline ‘what’s your way?’ isn’t its soporific blandness, but the fact it misses the open goal opportunity for Dove to pick a fresh culturally charged battleground. By endorsing the absence of an opinion Dove have tried to be everything to everyone, and risked presenting themselves as nothing to no one. The truth is issues go through cycles. Where one issue might be combative today – an electric live wire that you can’t touch; in five years’ time, it might be the norm. Look at Pride. Brands that aren’t publicly endorsing the ‘Pride bandwagon’ now feel outdated. Breastfeeding in public may very well be a contentious facet of modern day motherhood, but Dove lacked the confidence and uncharacteristically the empathy to truly grasp the nettle: Whether people say it’s ok to breastfeed in public or not is frankly irrelevant. Whether it’s ok to shame women for their personal choices is not. 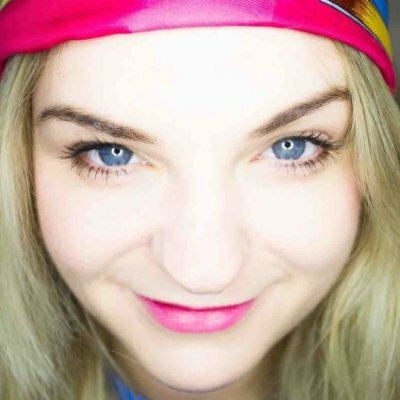 That’s the opinion Dove should have been full-throated in its defense of. 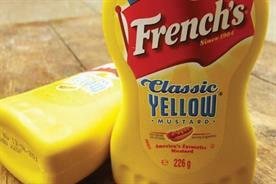 Any brand whose campaign can endure 13 years should be forgiven for a few missteps. And Dove has certainly had more hits than misses. The campaign’s roots lay in global research (aka big data for all you buzzword folk) showing only 2% of women consider themselves beautiful. That simple fact was the inspiration behind the Campaign For Real Beauty. Of course there are endless ways to make beauty an inspiration rather than a source of anxiety. So the hard part when the Campaign kicked off was not for teams to come up with ideas that could fuel the campaign, it was to see those ideas edited down to the ones that would genuinely make a difference. From "Beauty Sketches" all the way back to "Evolution" and the "Fat?/Fit, Grey?/Gorgeous?" posters, we can all recall these iconic ads. They have scale. And they move people. None are about "current" issues - all are about to the issue and they make Dove’s reason for being super clear. Dove’s current efforts seem to have drifted into attention seeking tactics. The Fake News ad was a fun topical way to remind everyone Dove make Deodorant (without hyperbole) but the breastfeeding campaign leaves me wondering "why Dove?" With the vanity of the selfie-generation, I'd say there is plenty of need and opportunity for Dove to continue its mission on a mass, populist scale rather than search for small stunts to generate a passing headline. I've no doubt they'll find fresh ways of elevating their efforts back to the heights they've so often reached previously. Unilever was an early pioneer in ‘purpose-driven’ branding, with Dove’s Real Beauty campaign cited as the most famous and successful example of building a brand with meaning and purpose. However, as businesses have become increasingly fixated with purpose-driven marketing they have muddied the waters on what this is. People have become over exposed to brands wading in too deeply on social and political issues, often clumsily trying to solve problems by adopting causes and campaigns that they’ve never been near before. As a result, people are now highly experienced to evaluate this type of activity and bring increased levels of critical thinking and cynicism towards them. This is enhanced by the fact that brands usually can’t resist the ability to pull back from the purpose and shoe-horn in the big product sell, thus fully revealing the ‘behind the curtain magic’. So whilst brands may have the insight and purpose well honed, the actual execution can fail to convince, as demonstrated in the case of the ‘body shaped’ packaging which takes the purpose too far over the literal line and just starts to feel overly manufactured. The breastfeeding ad is another similar example. At the heart of the idea is excellent, relevant and topical insight. ‘What’s your way?’ speaks to how parents have individual styles and approaches and that there is no right or wrong way to parent. However, by executing it in a way that is designed to provoke a reaction oversteps the mark. It reframes Dove’s purpose as now being a stage for discussion and debate as opposed to being an empowering force supporting for all women, it divides us instead of bringing us together, which is arguably exactly what the world doesn’t need any more of right now. ‘Profit’ has become a dirty word, so brand purpose aka ‘social good’ is top of the agenda for those brands wanting a slice of the action. But are these brands really by our side helping us navigate life’s challenges, or are they glibly monetising social causes? 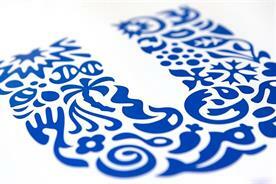 I've long been a fan of Unilever's sustainable growth strategy and their brand campaigns built around social purpose. Dove promotes self-esteem, a more esoteric purpose to link to product. The Dove campaign for Real Beauty was beautifully crafted and tapped into an insight that made women feel that Dove did understand them and could be an ally. It was new and exciting and gave Dove permission to talk to women about things other than beauty products. This relationship is a contract with the brand based on trust. Trust that Dove really understands them and trust that Dove was not selling to them off the back of a social cause. It’s a fine line to walk and they have stumbled. Dove wanted to celebrate the diversity of parenting choices in their breastfeeding in public campaign, but got it wrong as mothers didn’t think this should be a public debate in the first place. When the brand purpose became inextricably linked to product as was the case with the ill-fated Dove body shaped bottles project, a line was crossed. Who were they to define body types when they usually celebrate individuality? 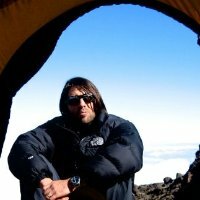 Dove is a great brand and their social purpose is laudable and sustainable. There recent failings were not out of malice or cynicism, but an attempt to be the good guy. Dove haven’t lost their way, it’s a bump in the road, however it should tread very carefully going forward to ensure it keeps its contract of trust with its army or supporters.